Middle school is the perfect time to introduce more independent learning and part of that process will be teaching students how to stay organized and on-track. With a few simple tools you can help your middle school kids get organized. Middle school is a great time to work on organization skills. As kids get older, they will be responsible for more of their own learning so giving them the right tools to get organized and ready for independence will help them in the long run. Here are a few simple ways you can help your middle school kids get organized. As with any job, it's important to give them the right tools - even for getting organized! Make sure they have all the basics (notebooks, paper, pencils, pens, etc) but keep things simple. An elaborate organization system doesn't work for kids this age. Keep it simple. All you'll need are some square 3x3 Post-it® Notes, Post-it® Lined Notes, and one-inch Post-it® Flags. The Back-to-School section or stationary department of your local Walmart (you can even buy what you need online!) should have everything you need. Most assignments fall within a few areas - pages and books to read or written assignments and worksheets to complete. The hard part for kids is remembering what they need to do! So the first thing to do is teach them to write it down. Train your kids to write down their assignments. It doesn't have to be fancy. 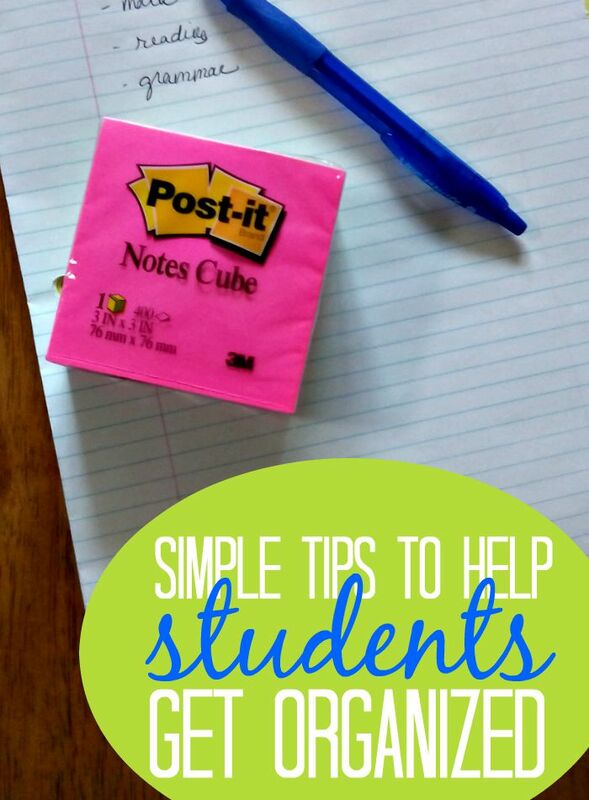 Just give them a pad of Post-it® Lined Notes to keep in their binder. Every day, when you are teaching and assigning work, have them write down their assignments. They great thing about Post-it® products is that your kids can just stick them to their textbooks - no losing an assignment book! One problem I've discovered in keeping an assignment list is that my daughter will just write down 'math' but forget to put page numbers or other information. Later on, when she's working through her assigned work, she won't know what she's supposed to do. Now I have her flag the pages she needs to do each day. She grabs the Post-it® Flags from her binder and marks each workbook or textbook as I assign each subject. When she's ready to tackle her assignments she has the pages marked and ready to go. All she needs to do is move the flag to the next section in her textbook and she's ready for the next day's assignments. Instead of daily reading from textbooks, TJ is often reading from a variety of books each day. She may have history reading from a variety of sources, daily literature assignments, free-reading time, science books... the list changes every day! It can be difficult to keep track of what she's supposed to read so we've started using a very simple technique for keeping all that assigned reading organized. The front page of every book has a 3x3 Post-it® Note with daily reading assignments. Most things are usually one or two chapters or a certain number of pages per day. All she needs to do is check the front of each book to find out the specifics for that book before she begins reading. All her books are kept in one basket so nothing gets lost or misplaced. Do you have any tips for helping middle school kids get organized? 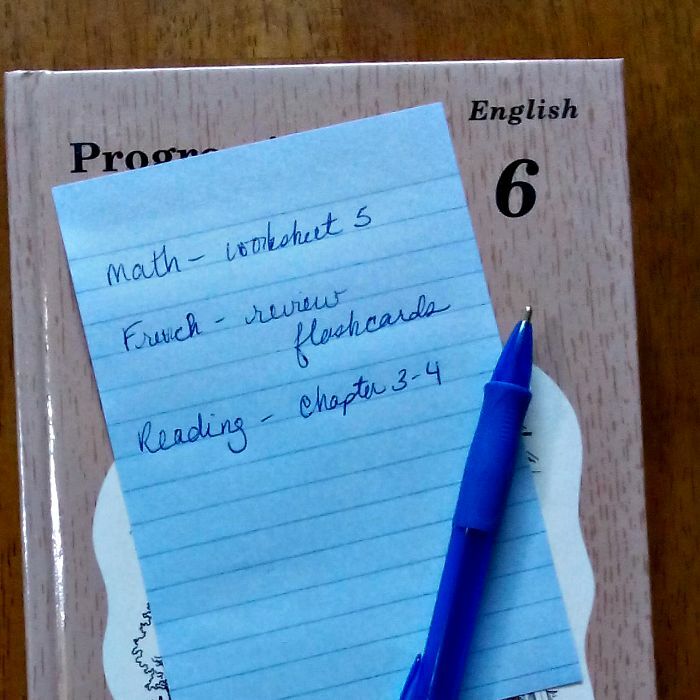 These 3 things have helped my daughter keep her schoolwork organized. It isn't a big elaborate system, but using easy supplies like Post-it® Notes & Flags works very well for us. Leave me a comment and tell me about your simple organization tips for middle school kids! Need more organization tips? Check out these amazing projects!